We already had a fork of bfgminer with support for the ZeusMiner devices, however there is now an official branch of bfgminer 4.2.0 that has support for Zeus ASIC chips (source) that you can download and try. 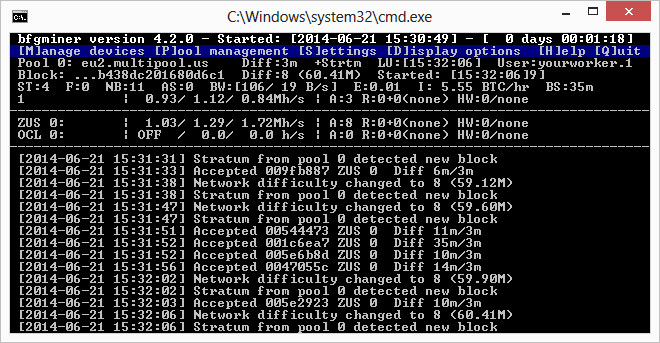 The support for the Zeus is still a work in progress, so it will be some time before the support gets integrated in the main branch of the miner, but it is already working quite well. Below you can download a windows binary ready for testing do check the included Batch file example for the options how to run the software so your ZeusMiner will be detected and used in the miner. The default configuration is for ZeusMiner Blizzard (6-chips) running at 328 MHz frequency, also do note that the command line disables the bfgminer to run on any OpenCL devices that you may have, so they will be show as OFF in the list as you can see on the screenshot above. Interestingly enough Zeus has finally have made available the source of their cgminer 3.1.1 for with support for the ZeusMiner ASIC chips on a GitHub repository.